It really defies all belief, doesn’t it? 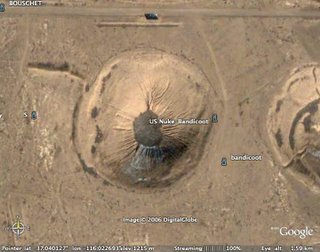 [Update: 5 November 2005] Here are some more of my posts on nuclear weapons. 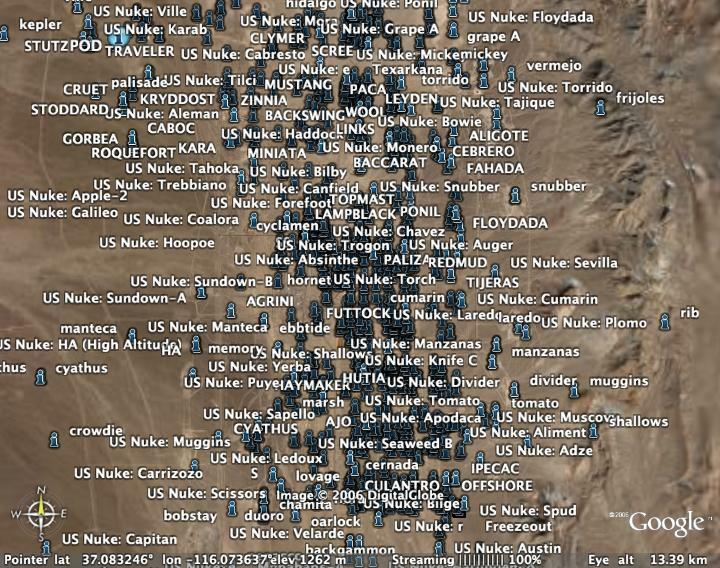 Between 1951 and 1992, there were a total of 925 announced nuclear tests at Nevada Test Site. 825 of them were underground (seismic data has indicated there may have been many unannounced underground tests as well). The site is covered with subsidence craters from the testing . 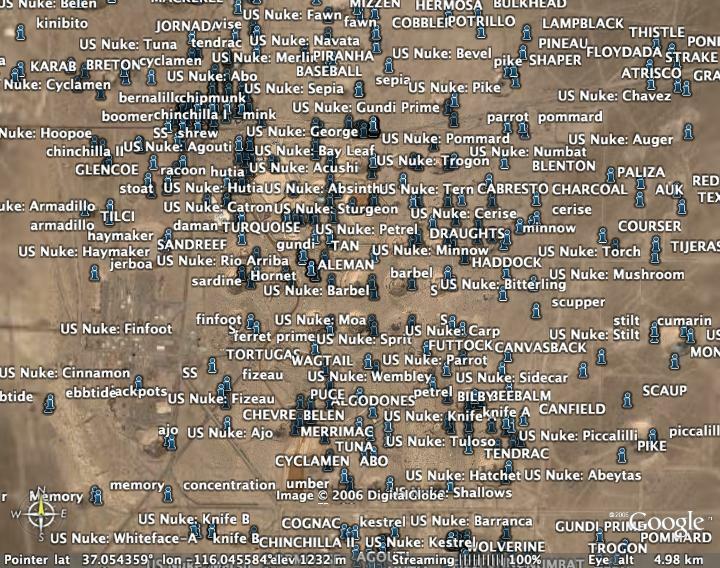 The Nevada Test Site was the primary testing location of American atomic bombs; only 129 tests were conducted elsewhere (many at the Pacific Proving Grounds in the Marshall Islands). On July 17, 1962 the test shot “Little Feller I” of Operation Sunbeam became the last atmospheric test detonation at the Nevada Test Site. 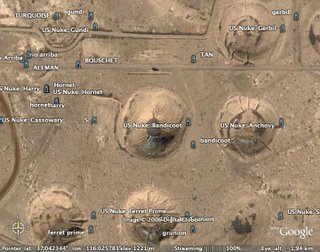 Underground testing of weapons continued until September 23, 1992, and although the United States did not ratify the Comprehensive Test Ban Treaty, the articles of the treaty are nevertheless honored and further tests have not occurred. Tests not involving fission continue. 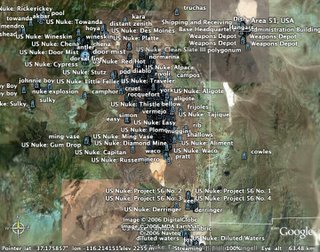 In a report by the National Cancer Institute, released in 1997, it was determined that ninety atmospheric tests at the Nevada Test Site deposited high levels of radioactive iodine-131 (5.5 exabecquerels) across a large portion of the contiguous United States, especially in the years 1952, 1953, 1955, and 1957—doses large enough, they determined, to produce 10,000 to 75,000 cases of thyroid cancer. 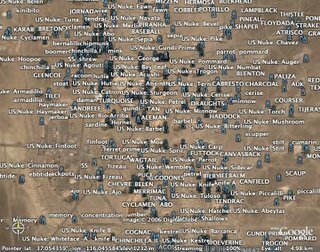 In 1993, residents living near the Nevada Test Site were included in the Radiation Exposure Compensation Act, 1,375 claims were honored (1,121 were denied). As of 2004, the test site offers public tours on approximately a monthly basis, although the taking of souvenir material is prohibited. Interesting… and scary. Like the details of the Teller-Ulam design, such as they are known. Speaking of scary photos, here’s one of a MIRV test. For the uninitiated, a MIRV is a (usually nuclear-tipped) missile that is capable of delivering multiple, independently targeted nuclear weapons into a theatre of operations. Each warhead could be set to strike a different city or missile base, greatly multiplying the potential destructive power of a single missile. The negotiations on the use of MIRVs made up a critical component of nuclear limitation talks between the Americans and Soviets during the later decades of the Cold War. Guess Ike would have been tarred and feathered and “rode outta town on a rail” today. When I was teaching Advanced Placement Government & Politics, students found it hard to believe that a Republican military-man President could have uttered such a statement. Great warning, though, Ike. Shame no one heeded it. Terrific series of photos, btw. This post is discussed on this rocketry related blog. “As Ed Grothus will tell you, an atomic bomb looks like a soccer ball. The central core of the bomb is made of a radioactive metal such as plutonium or uranium that’s constantly sending off alpha particles. 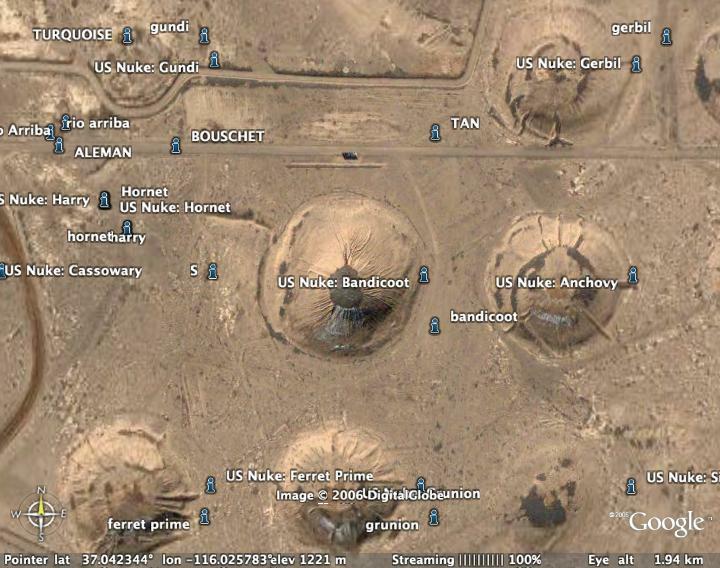 Around it are placed hexagonal and pentagonal explosive charges that look like the faces of a soccer ball. To detonate the bomb, these charges are simultaneously set off. The key word, here, is simultaneously; in order to work, the charges have to detonate within a few hundred millionths of a second of one another. Designing the charges and the detonation mechanism were two of the major achievements of the Manhattan Project. When the charges are detonated, they compress the radioactive core very fast and very hard, which causes it to become smaller and denser — more massive, in other words. Past a certain point, this causes a chain reaction, in which the nucleus of the plutonium atoms begin to split. This releases massive amounts of both gamma radiation and kinetic energy in a matter of milliseconds. Eisenhower warns of the military industrial complex. Here is an especially poignant demonstration of a case where money was wasted on nuclear weapons, while it could have been helping to alleviate severe poverty: India has built a nuclear submarine, capable of launching ballistic missiles. Decades of Soviet nuclear testing on the steppes of Kazakhstan have been blamed for an alarming number of health problems suffered by residents in the area. Now scientists are trying to determine whether the victims are passing on faulty genes to their children, the BBC’s Rayhan Demytrie reports. The testing continued for 40 years. Nearly 500 nuclear explosions were carried out. 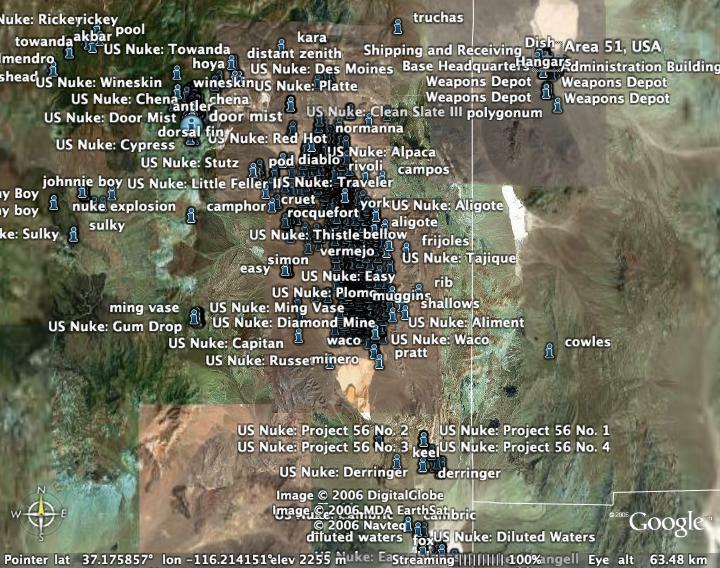 More than 100 of them were above-ground devices that sent nuclear fallout far beyond the test area. At the time, thousands of people who lived within a 300,000 sq km territory surrounding the Polygon were exposed to high levels of radiation. Back in the early 1960s, Amchitka, a volcanic, tectonically unstable island in the Rat Islands group of the Aleutian Islands in southwest Alaska was selected by the United States Atomic Energy Commission to be the site for underground detonations of nuclear weapons. Three such tests were carried out and, thanks to Youtube, you too can watch some declassified US Government Amchitka test films. The first, named Long Shot, was an 80-kiloton blast (video) and was followed by Milrow (1-megaton) (video) and Cannikin (said to be under 5-megaton) (video). There’s also a declassified video that discusses the program at Amchitka in more detail. Incidentally, Greenpeace was born out of opposition to the tests at Amchitka. Also, the Wikipedia article on the island, which is decent. Thanks for sharing the screenshots. 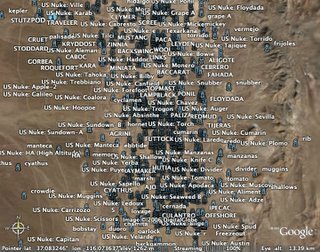 I looked at GoogleEarth earlier this year to see the proving grounds and I couldn’t find a way to make it show all the names of the nuke tests so this is really handy. One of the default data layers within Google Earth includes the test names associated with the craters. Just try turning various ones on until they appear. Today, on ARTE television, the film HIROSHIMA was aired and the scene that was most worrying to me is where James Franck tries to get over the point that, while the short-term military benefits (forcing the Japanese Tenno to concede defeat and submit surrender) might seem huge from the then-present standpoint, they would be dwarfted by the haunt of the arms-race the first demonstration of the feasibility of an atomic bomb would unleash… and is disregarded, with the unevitable consequence that at the beginning of the third millennium AD, more and more states are unlocking the pandora’s box nuclear weapons constitute. While even though more than 23000 nuclear warheads are believed to exist, the actual outbreak of a nuclear war seems relatively unlikely . Much more disastrous is what Eisenhower’s statement “Every gun that is made every warship that is launched every rocket fired, signifies, in the final sense, a theft from those who hunger and are not fed, those who are cold and are not clothed” is reflecting: the 1.4 trillion US Dollars ANNUALLY spent on military expenditures could by FAR be better invested in providing nutrition to the poor, knowledge to the illiterate and building infrastructures where most needed. is there a KLM file for all the test sites? here is a side story that a group of brain tumor survivors of a tumor that develops in the womb…has raised some questions as to when and where they were born…if a test was conducted? we are making a KLM file of where the survivors where born….